Once you find a gift or gifts that you like simply click the "Add to Cart" button. This will display a cart pop-up with the option of adding a card (see Step 2) or paying for your gift (see Step 3). You can also close the cart to continue shopping. Once you've added a gift to your cart press the "Add a Free Card" button that appears in your shopping cart below your gift. You'll have the option of a printed, eCard or PDF card. You may also checkout without selecting a card. Review your order and then pay using a credit card (Visa, MasterCard or Amex) or via PayPal. Upon payment, you will be instantly emailed an eReceipt of your donation. Shopping by category is a great way to find gifts that support initiatives close to your heart. This year we've added many new gifts plus don't forget to browse our Matched Gifts. Here is the full list of categories for your browsing pleasure: Canada | Community Services | Education | Farming | Livestock | Nutrition | Women's Income. On a tight budget or have a spending limit for gifts this year? Don't worry, we have gifts for as low as $12. Want to make a bigger impact? Choose a gift worth $100 or more, or add a ‘top-up’ gift when you check out, which will be applied to our general programming. There's a Best.Gift.Ever to match every budget. You can find the full list of gifts on the homepage. Use the sorter at the top left of the page to sort gifts by Most Popular, Price - High to Low, Price - Low to High or by Newest gifts first. + What is the Best Gift Ever Catalogue? It's an opportunity for you to help children supported by Canadian Feed The Children, and honour friends and family at the same time. By choosing from the many life-affirming items in the catalogue, you give children what's missing from their lives. You can mark the holiday season, a birthday, wedding or any special occasion by giving a gift that turns into better health and greater life opportunities for children facing the hardships of poverty. 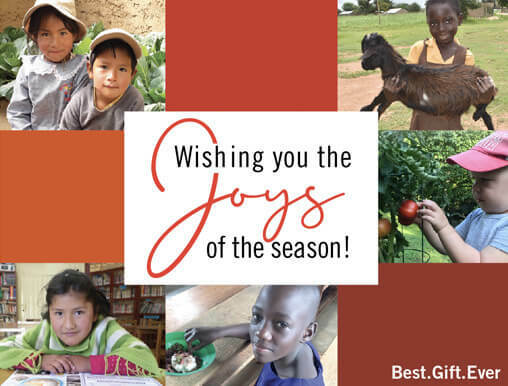 Through the Best Gift Ever catalogue, you make a donation toward items that make a lasting difference in the lives of children and families here in Canada and countries around the world. + Can you explain how the gifts help children? Every gift that is listed in our Best Gift Ever catalogue has been identified by the communities we support as being vitally important to ensure children's health and well-being. The gifts of livestock, school books, water taps, community-building programs and all other items are provided as part of the broader programming implemented by Canadian Feed The Children and our local partners. When you purchase a Best Gift Ever, funds go towards the range of development programs in the communities we support. The projects go beyond the simple provision of items; they also include training, project monitoring and evaluation, local expertise and support â€“ everything needed to deliver effective, sustainable, high-impact and meaningful change in a community. + How are the gifts delivered to the communities? Items that you choose are, first, identified by the communities as required, then are purchased locally to ensure the products (for example, fruit trees, seeds, livestock) are well-suited to the local environment. No items are EVER shipped from North America to our international locations. Buying locally helps support the entire local procurement chain, keeping transportation costs to a minimum and generating ripple effects that benefit the local economy for years to come. + Will you send a gift card to my honouree or do I? You have three choices in cards: email, PDF (for printing at home), or print. 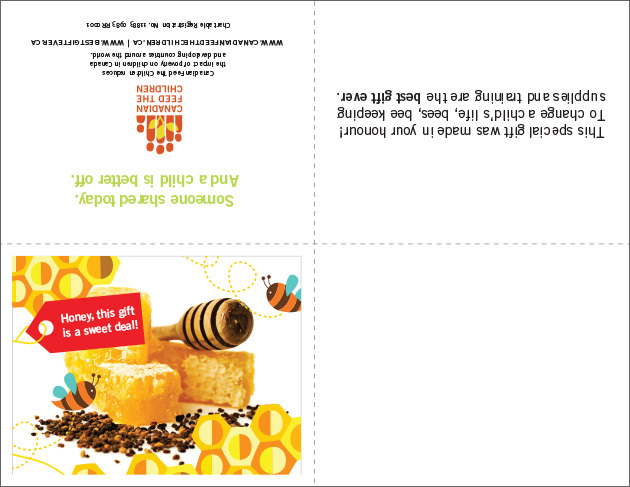 If you choose a printed card, we can send the card by post to you or to your honouree, whichever you prefer. + Can I order gifts for more than one person at a time? Yes, you can. And, you can select a different card for each gift if you prefer. + Is the Best Gift Ever Catalogue available year-round? Yes! The new gift catalogue is launched each year in mid-October, and runs until the next October. All items are available throughout the year and make excellent gifts for any occasion. + Can I purchase a Best Gift Ever if I am not currently a donor? Yes, absolutely! You can make a donation by choosing a Best Gift Ever whether or not you have supported Canadian Feed The Children in the past. We welcome your participation and your support! + Can I send a gift to my sponsored child or his or her community? Gifts from the Best Gift Ever catalogue cannot be directed to a specific child or community. These gifts are designated for communities where specific needs have already been identified, and your gift will go a long way in funding these projects from start to finish. + Can I receive a photo or report on my gift after it has been delivered? Due to the prohibitive costs and administration required to report on each individual gift, we cannot provide photos and stories on the distribution of specific gifts. Our newsletters, website and annual reports give detailed updates on all our programs for children, which include the provision of all items in the catalogue. + Is the delivery of Best Gift Ever items guaranteed? Yes, all donations toward a particular gift item get pooled to fund the community project it supports. In the event that money raised through the Best Gift Ever catalogue exceeds the funds required for our programs, excess funds will be directed to support similar Canadian Feed The Children programs for children. + Will I get a tax receipt for the purchase of a Best Gift Ever? Yes, all Best Gift Ever purchases are tax receipted. When you order online, you will receive an immediate charitable tax receipt in PDF format by email. When you order by phone, you can choose to receive an electronic receipt or have one mailed to you, usually within two weeks. Canadian Feed The Children's charitable registration number is 11883 0983 RR0001. + Do I get the tax receipt or can I send it to the honouree? Only the donor can receive the tax receipt. Tax receipts cannot be sent to the honouree. If you are paying by credit card, tax receipts will be issued to the name of the credit card holder, per CRA regulations. Tax receipts will not be issued to individuals as a result of group activities such as a school or community campaigns. + How long will it take for my gift card to be delivered? While we can't guarantee delivery time, Best Gift Ever gift cards will be processed and sent by mail within 48 hours of purchase or by email within one hour. No. 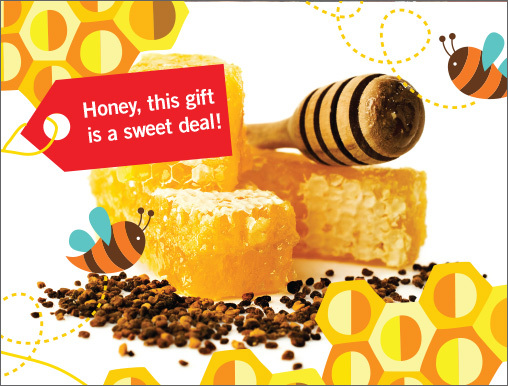 Your purchase of a Best Gift Ever item is a donation to Canadian Feed The Children, so no taxes are charged.